Attempts by the racist “alt-right” to recover from the stumbling block of August 2017’s disastrous Unite the Right rally have been dashed by several recent upheavals. Each incident underscores a singular, pervasive division among the far right that few are willing to deal with openly or frankly. Where the alt-right offered a sole unifying principle — the abstraction of white identity — it sought to overcome the vast gulf of wealth, privilege and education without ever addressing fundamental class differences. Jesse Dunstan, cohost of the white supremacist “The Daily Shoah” podcast summed up the debate in a segment on April 13, 2018, where he referred to TWP as a "fraudulent and heretical 1.0 trap"
"Class war between us will not be part of that fight. The TWP, to KEK's displeasure, rested its ideology on class warfare rather than collaboration." The alt-right’s recent stumbles are an inevitable byproduct of its attendant organizations’ failure to reckon with the sharp class distinctions separating its elitist, university-set leadership from its working-class base. The alt-right saw itself as an ascendant insurgent movement in the aftermath of the 2016 election. The Unite the Right rally would be a culmination, in their minds, of all of its energies spent meme-ing Trump into office and the debut of a new, regressive political class. The events of August 12, 2017 dashed any hopes the fledgling movement had for political viability. In a stunning collapse, the movement’s leaders and personalities immediately turned on one another in a desperate scramble to assign blame for the day’s colossal failures and the tragic death of anti-racist protester Heather Heyer. The “optics” question parallels concurrent and ongoing debates about “White Nationalism 1.0 vs. White Nationalism 2.0” — euphemisms to describe the conflict-ridden interpersonal and digital landscape that characterized the white nationalist scene in the early 2000s versus the alt-right’s idealized cooperative model — and “vanguarding vs mainstreaming” approaches that would carry white nationalism into mainstream relevance. “1.0’s” are typically characterized as “vanguardists,” prone to brash, ineffective street activism that did little to appeal to “normies” or raise the profile of white nationalist organizations. “2.0’s,” the image conscious and media obsessed “mainstreamers,” are exemplified by the hackneyed "dapper white nationalist" portrayal of the alt-right that proliferated during the 2016 election. Griffin’s optimism that the perceived differences between the generationally divided 1.0 and 2.0 could be overcome in the alt-right proved short-sighted as media coverage of the alt-right became universally acerbic in the wake of the deadly rally. The vicious “optics debate” began in earnest after the several banners of the alt-right retreated in disarray after the Charlottesville rally descended into chaos. The general mindset was that future public displays of force would only be viable with some degree of top-down cooperation in planning and coordination — particularly on the issue of dress code. At the heart of Anglin’s critique — which cited Spencer-acolyte Nathan Damigo’s assertion that the rally was “cringe” — is the notion that an “80s type Neo-Nazi movement,” that cavorted with the likes of “Neo-Nazis and the KKK” would repel “normal middle class young guys who simply want to have their nation back.” These individuals “tend to be repulsed by goon marches by men in tacky military outfits and garish regalia,” he continued. 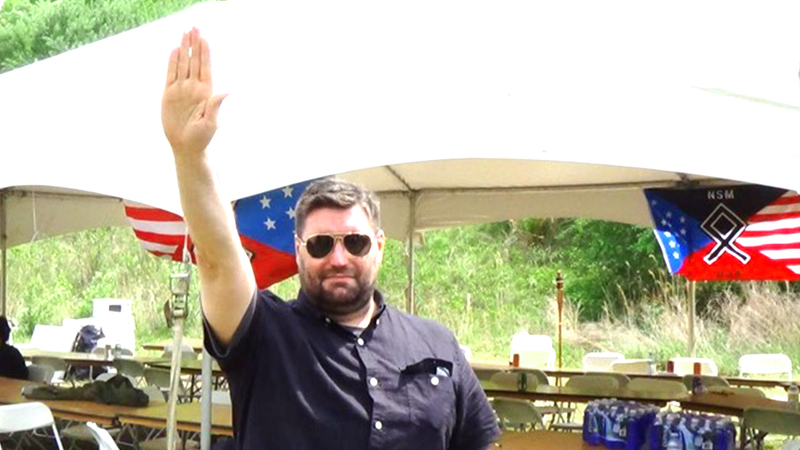 While Anglin indicated that he “never thought of disavowing” Heimbach and other NF leaders, his contempt for the white supremacist movement’s working class was evident. I do not propose to tell working class people what to do. But given that they are only 10% of the American white population and are – just as a general rule – going to have less agency and more substance abuse problems than the middle classes, I am not going to make appealing to them my prime goal. “These types think themselves to be the next social elite, whereupon they can occupy stuffy cabinets with leather chairs and sip wine whilst stroking each other’s egos over meaningless yammering coated in complex wording,” user “Kombat-Unit” wrote on August 26, 2017. The fusillade continued back and forth, with both sides denigrating one another on optics. On October 31, 2017, Griffin, a leadership figure in the LOS, a NF coalition group, authored a piece titled “Hard Right,” in which he accused Anglin of doing little more than “shitposting” and siphoning $150,000 from an already cash-strapped movement. 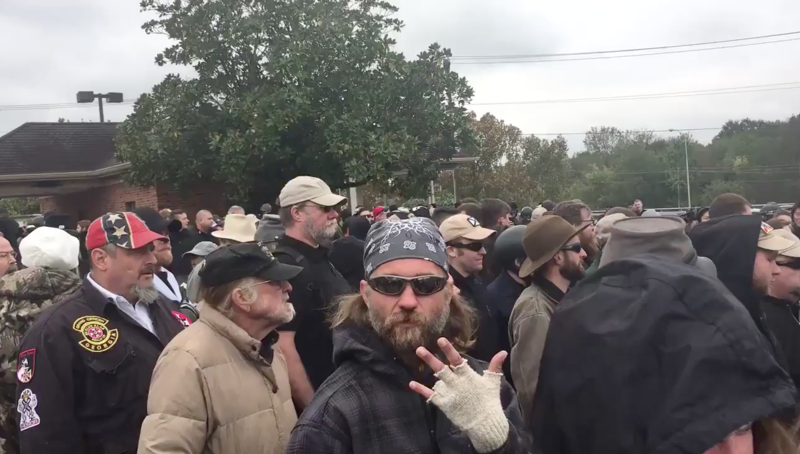 A purported member of the violent Aryan Circle prison gang was present during the Nationalist Front's Shelbyville rally in October, 2017. Griffin’s criticisms of IE and its latest leader, Casey, began simmering in the immediate aftermath of Charlottesville. The right lurched into 2018. The LOS and TWP hosted a handful of small events that attracted more protesters than racists. Spencer vowed to continue his college tour, intent on funding future activities through a strategy of lawfare. This plan came to a close at Michigan State University, when a crowd of anti-fascist protesters met and brawled with Heimbach, the TWP and a handful of Spencer’s coterie. The melee resulted in the arrest of 24, including NPI’s director Gregory Conte. The sentiment that the movement’s less educated should act as street toughs: The old movement dichotomy between “suits” above “boots” is recast in this context as “those who can read” on behalf of the movement above “those who should bleed” for it. After the rally, a photo emerged of Johan Carollo, TWP’s regional commander in Knoxville, Tennessee, and Conte clutching one another amidst the brawl. AltRight.com ran a blog titled “A Picture of Unity” that lauded the image. One young man, known and respected by all in the movement as a deep thinker and erudite writer, with a sensitivity for art and a deeply nuanced understanding of history and culture, confronted the police as they manifestly refused to do their job. He faced down a squad of heavily-armed thugs in full riot gear and, with an impassioned speech, reminded them of their duty under the Constitution. He sported the fashy undercut, tailored white shirt and khaki pants popular with educated identitarians. In that moment, another man sprang to his defense. I was with this man the night before, as he coordinated the shuttling of conference attendees to our backup venue. I knew him to be a young man of courage and devotion to duty. That afternoon on the road, he was decked out in the black fatigues of the socialist TWP. His neck and hands were etched with tattoos; his face and bearing those of a worker. The two men could not have looked more different. Their differences spoke to what is perhaps the greatest wedge presently dividing the American pro-white movement: that of class sensibilities. This is not an accident. Days later, however, the picture of class unity had faded, at least for TWP. “No working class kid is gona [sic] follow spencer my fiance thinks he is a fag lol,” user “westvirginiatrad” wrote in the TWP Discord server on March 10, 2018. Tony Hovater, one of TWP’s founding members, also took a separate view of the events at MSU — particularly of Spencer’s apparent embrace of his minor celebrity. TWP’s objections and complaints amounted to nothing when the organization completely collapsed a few nights later when Matthew Heimbach was arrested amid allegations of domestic battery and infidelity with the wife of TWP cofounder, Matthew Parrott, who is also his wife’s stepfather. Many across the right mocked Heimbach, Parrott and the TWP, offering them as proof that the optics issue was settled. The hosts of TRS’s “The Daily Shoah” podcast dwelt on the incident in an episode interspersed with audio clips from "The Jerry Springer Show" and "Trailer Park Boys." “You want to LARP [live action role play] like it’s Greece and you’re Golden Dawn when you look like you’re straight out of Golden Corral,” Jesse Dunstan, a longtime host of "The Daily Shoah" under the moniker “Sven,” joked with his co-hosts. Mike Peinovich, another host of The Daily Shoah, expressed regret for his prior association with TWP. Peinovich appeared at several rallies with Matthew Heimbach including rallies in Pikeville, Kentucky, and Shelbyville, Tennessee, in 2017. Mike "Enoch" Peinovich of The Right Stuff's "The Daily Shoah" podcast sieg-heiling while in Pikeville, Kentucky, for a TWP rally. That this fundamental debate on organizing principles came under the guise of a shrill argument over aesthetics, costume, and pageantry shows the depths of the alt-right’s narcissism and the limits of its willingness to engage with substantive questions. These divisions have existed throughout the lifespan of American white supremacy. Debates around the subjective appeal of blue-denim Americana, plastic stahlhelms and sieg-heiling are proxy battles wherein the far right abandoned all attempts at cohesion while failing to address fundamental questions of class division among its ranks.